The green fronds of sensitive or bead fern (Onoclea sensibilis) wither in early frost. 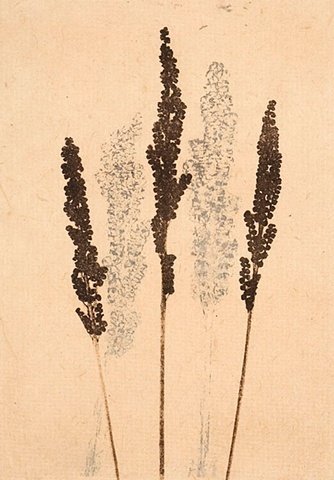 The brown fertile fronds, carrying spores in beadlike leaflets, remain, however, like sentinels through the snows of early winter. These beaded fronds are the subject of this artwork made by sequential printing of two etching plates--a copper one followed by a solar plate--with a sheet of thin grampi sandwiched between the two images. The translucence of this Asian paper reveals the underlying image of the first print. Edition of 20.